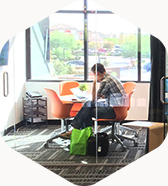 EZ Spaces, A coworking space designed for more collaborative ways of working in Gilbert Arizona. The idea is simple: independent professionals and those with workplace flexibility work better together than they do alone. Coworking spaces are about community and sustainability. 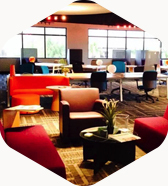 EZ SPACES LLC offers a full assortment of amenities – guaranteed to rival any executive suite or virtual office. Conveniently located in the Northwest corner of Williams Field Rd. & Val Vista Dr. Becoming a member means more than just having a desk to sit at each day. Our space is designed to re-connect independent workers to one another. Be sure to check out our pricing plans. Discover the software we developed to manage our Coworking Space! Val Vista & Williams Field Rd. SCHEDULE A TOUR for your free first time visit. View pricing options and become a member today. EZ Spaces exists to provide collaborative membership based coworking space to the modern professional that is both affordable and flexible with an impressive array of open forum and private environments for conducting business.